Does God Ever Loose His Patience? HomeBlogThe BibleDoes God Ever Loose His Patience? The book of Nahum, a short three-chapter prophecy, centers on the city of Nineveh. If this city sounds familiar, if might be from the book of Jonah when God sends his prophet there to prophesy its destruction. After hearing Jonah’s blunt, half-hearted message of doom, all of Nineveh, from its king to its people, repents, and God gives them a reprieve. Jonah becomes mad and complains about this to God, almost criticizing his mercy. Later the prophet Nahum resumes the predictions of doom on the people of Nineveh. In fact the entire book of Nahum focuses on Nineveh. It ends with the ominous words, “Nothing can heal you; your wound is fatal,” (Nahum 3:19). There is no hope. There is no call to repent or make amends for their errors. The verdict is final with no chance for appeal. If this view of God makes you uncomfortable, as it does me, recall that we cannot fully know God or understand his ways. We want to rightly bask in his love, but we must not lose sight of the need to also fear him. 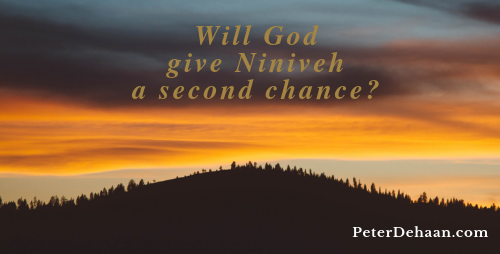 Nahum and the city of Nineveh remind us of this other side to God’s sovereignty.